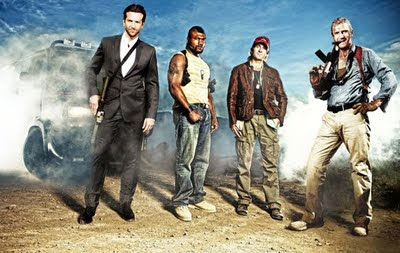 Making the rounds on the web is the first publicity picture for the upcoming 2010 A-Team film. The motion picture is based on the classic 80's television show starring Mr. T and George Peppard. My first thought looking at this picture is the interesting decision by director Joe Carnahan to have these actors actually faithfully resemble the characters from the original show. Other movie adaptions of popular television shows such as S.W.A.T, Mission Impossible and even Miami Vice re-booted the franchise completely with only slight references to the original shows. Which I think was a good thing. My hope is that this is just a fun publicity shot and the plot and characters stray significantly from the original series. As much as I liked the show growing up, a lot of it was really campy. I mean SERIOUSLY over the top. Even back then, at my young, naive, non-critical age, I knew the show was silly fun. If one ever gets the chance to watch the old episodes, they'll notice that the characters use bombs, guns and explosives...but nobody ever got hurt or seriously injured. The room would blow up with the bad guys in it and the next scene they'd be dragged away unharmed in handcuffs. The A-Team would also escape government authorities with some of the must absurd scenarios and methods possible. It was like they'd be surrounded by the cops and they'd each put on Groucho Marx glasses and they'd escape through the front door unnoticed. The fact is despite the cool characters and premise, the show was similar in tone to The Dukes of Hazzard and MacGyver. It was THAT light and silly. I dig this cast though. Love Liam Neeson as Col. John 'Hannibal' Smith, Bradley Cooper as Lt. Templeton 'Faceman' Peck and UFC fighter Quinton "Rampage" Jackson as Sgt. Bosco 'B.A.' Baracus. If one hasn't had the chance to watch Jackson on the reality televison show The Ultimate Fighter let me assure the reader that Jackson has the wit, personality and star power to pull off the iconic televion character. The A-Team is scheduled for release June 11, 2010.